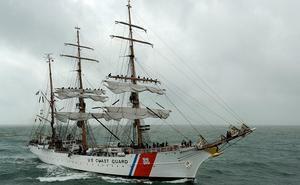 The USCGC Eagle is a 295-foot, three-masted barque used as a training vessel for future officers of the United States Coast Guard. Known as "America's Tall Ship," the majestic Eagle is the largest tall ship flying the Stars and Stripes and the only active square-rigger in U.S. government service. During this sea excursion, participants had the opportunity to speak with Cadets from the Academy, meet representatives from Elizabeth City, and Virginia State University. There were also officer trainees in attendance who are Hampton University students and are enlisted in the Coast Guard's program to attract minorities into the Coast Guard, entitled College Student Pre-Commissioning Initiative (CSPI).